Competing throughout the 2500cc Grand Prix Formula years of 1954-60, the Maserati 250F is one of the most famous and iconic racing cars ever built. This superbly illustrated book is one of the most detailed accounts ever written about a single model, and it features photographs by Tom March, one of the 1950s leading motor racing photographers, along with historic engine cutaways, chassis drawings, and technical descriptions of the 250F's evolution and development. Anthony Pritchard's lively and informative text includes reminiscences from some of the leading drivers of the day, including Sir Stirling Moss, Juan Fangio, and Mike Hawthorn - drivers who raced these historic machines during the halycon days when Maserati battled with Ferrari, Mercedes-Benz, and Vanwall for Grand Prix supremacy. 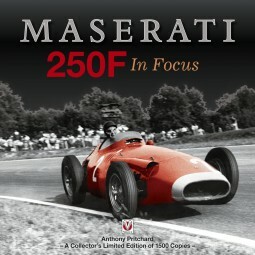 From the 1954 Argentine Grand Prix, to the 1960 US Grand Prix, a record of the chassis and race numbers of every 250F to have competed during this period is presented, along with detailed race histories and results, completing this most comprehensive and authoritative of books on Maserati's racing legend. Covers the period 1952 to 1960, and the T1 (1954-6 - although examples were raced until the end of 1960), T2 (1956 Italian Grand Prix), T3 Lightweight cars raced by the works in 1957, V12 (1957), Piccolo (1958-59), and the Tec-Mec (1959), the Maseratti's successor.